The holiday season brings in a lot of new customers, but you’ll be seeing abandoned shopping carts, too. On average, 67.44% of online shopping carts end up being abandoned for a variety of reasons. Some shoppers simply abandon carts to compare prices with a different vendor or to come back to them later, while others abandon because of shipping policy issues or bad user experience. Many of these abandoners are still good prospects, but you need to give them a push in the right direction. These three methods can help you get them to come back and complete their purchases. I’ve already talked about retargeting (or remarketing) in the context of turning one-time buyers into repeat customers, but its main purpose is to get people who visited your website without buying to come back and complete a transaction. 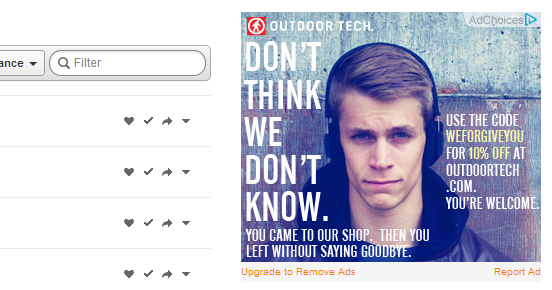 We saw this retargeting ad for Outdoor Technology back in July, and we still think it’s brilliant. Retargeting ads follow your prospects around the web and serve them ads that remind them to return to your website. Relevance and timing are crucial when it comes to a retargeting campaign. Knowing your customers’ buying habits and product preferences can help you develop an effective retargeting strategy that results in more sales. Email marketing is a particularly effective strategy when dealing with shopping cart abandoners. A survey conducted by the E-Tailing Group showed that 61% of retailers reported that their triggered email marketing tactics were “very/somewhat” successful. 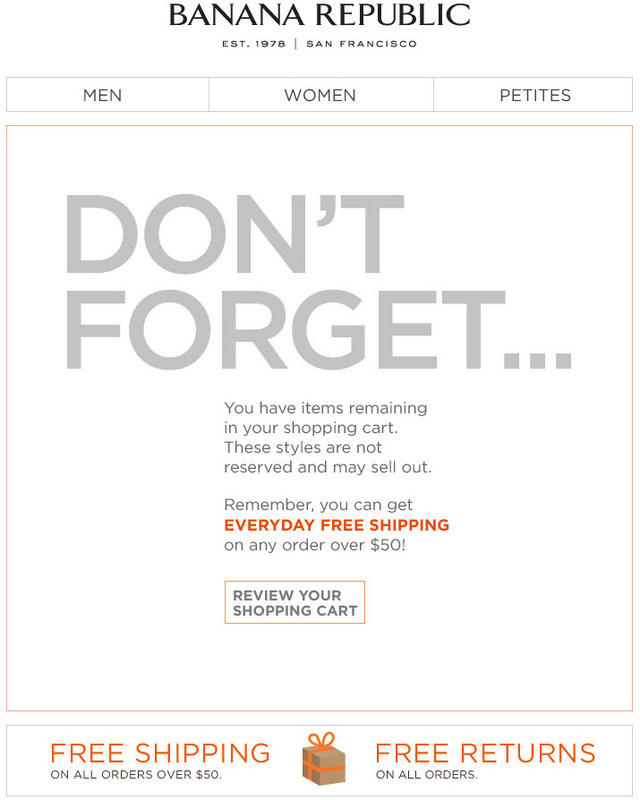 Right after the customer leaves the website – This email typically asks the customer if there was a problem checking out, and gives them a little nudge to complete their order. Within the first 24-hours – This email should reassure customers about the quality of your products and services through reviews and testimonials. Within the first 7 days (after the first 24-hours) – The third email should offer an incentive to encourage the customer to come back, whether in the form of a freebie, a discount, or a coupon. Each of your emails should be designed to convince customers to complete their transactions, and have a clear call-to-action button. Display security logos and provide information on how you protect your users’ personal information. Make it easy for shoppers to edit their cart so they won’t have to repeat the whole process if they make a mistake or want to modify their order. Offer different payment methods aside from credit cards. Offer support and display your contact information where they can easily see it. Add social proof in the form of customer testimonials and reviews. Offer free shipping or discounted shipping, and price guarantees, and good return/refund terms. Our digital marketing and ecommerce development services can help you provide an excellent online shopping experience to all your customers. Talk to us today to get started!